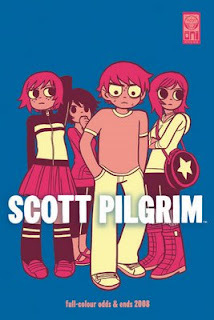 The fifth installment of the beloved Scott Pilgrim series is released today. I haven't read it yet because I don't get advance copies like some bloggers, but I do have a pretty nifty prize to give out! I have a fairly rare, not-available-in-stores Oni Press collection of miscellaneous Scott Pilgrim stories (see photo). These stories showed up in Free Comic Book Day comics and such and have now been collected in one handy comic book! And it's in FULL COLOUR! To get your hands on one of these babies, post your ultimate Scott Pilgrim soundtrack playlist in the comment thread. I'll draw a winner randomly from everyone who enters!